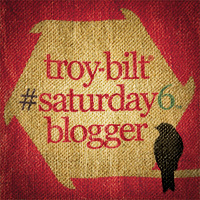 It’s been two years since I received and reviewed the TB675 EC String Trimmer and that machine has continued to start and operate without a snag. My favorite aspects of the trimmer have been the reliability and easy starting with the JumpStart enging starter, and the fact that it runs on straight gasoline, so I no longer need to keep any gas/oil fuel mixes around the garage. One feature that I never gave much thought about was the capability to use an assortment of TrimmerPlus Attachments with the Troy-Bilt trimmer. 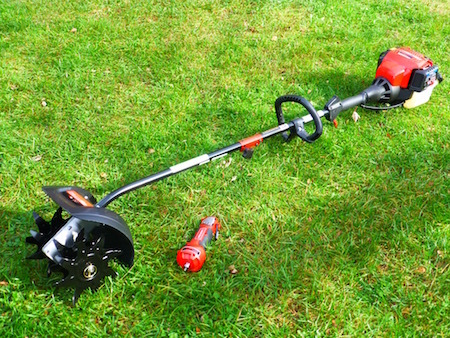 Well that all changed when as a member of the Saturday6 Team I was offered the opportunity to do a review of a couple TrimmerPlus attachments of my choice. 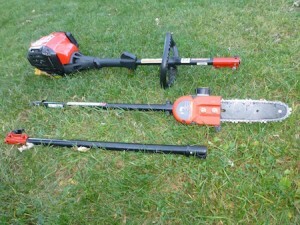 After mulling over a dozen or so attachment options that include everything from brush cutters and blowers, to hedge trimmers and a broom, I decided to review the cultivator and a pole saw. Once the attachments arrived and were unboxed I found that it was a breeze to switch from one attachment to another. In each case there is a single knob to loosen which enables you to remove one attachment and put another one in its place. 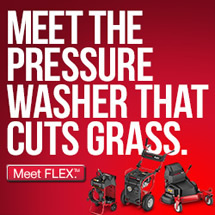 All of the TrimmerPlus attachments will work with current and recent model Troy-Bilt string trimmers. 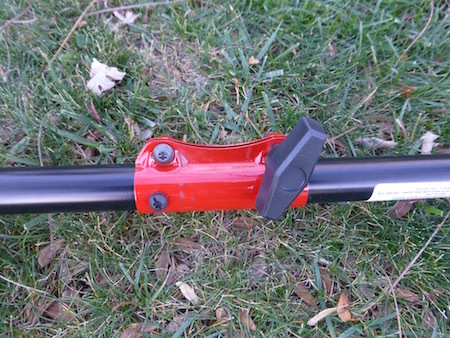 And even if you own another brand of string trimmer that accepts attachments any of the Troy-Bilt TrimmerPlus attachments will probably work with it. Both the cultivator and the pole saw that I received were constructed with metal parts and felt solidly built. I would guess that like the cultivator, all of the attachments are fully-assembled and ready to operate right out of the box. In the case of the pole saw the only thing required before the first use was to check the chain tension and adjust if necessary, and to add the supplied oil to the reservoir that lubricates the chain while cutting. First off I decided to put the TrimmerPlus Cultivator to the test in the garden. Keep in mind that despite the appearance, this is a “cultivator,” not a tiller; so it is best suited for working in garden areas that are already in use, as opposed to breaking new ground. That is the exact purpose that I had in mind when I decided to trial this unit. It is a perfect size for loosening the soil between plantings or reseeding, to cultivate paths between beds or rows in the garden, and to turn under cover crops or incorporate leaves and amendments into the garden. In the first task I used the cultivator attachment to lightly work up a garden bed that had been recently harvested after a crop of sweet potatoes and was ready to be re-seeded to a winter cover crop. The cultivator left the soil with a good texture ready for seeding and worked better than I expected in that I did not have any problems with roots or garden debris becoming tangled in the tines, and any large rocks that were encountered bounced harmlessly away and did not become lodged in the tines! The other job that I put the TrimmerPlus Cultivator to use in was to cultivate some pathways previously mulched with wood chips that had since started to break down and now had weeds growing through. Again the cultivator worked great, accomplished the objective, and did not bog down or become jammed on what was left of the wood chips that remained in the paths. In the end the cultivator attachment passed my tests and I would definitely recommend it. Also, despite my previous comment about this being a cultivator and not a tiller; I do think that it could be used to work up small areas of unbroken ground in a pinch, and provided you didn’t need to loosen the soil very deeply. The only warning that I have to offer is that this attachment does have some weight to it and you will be supporting good portion of that weight as you are using the machine. It was not a problem but is something that may limit the size of area that you will want to work at one time. Next up was the TrimmerPlus Pole Saw trial, and I’ll admit that I had modest expectations for the uses that I would put this one to, but it didn’t take long for me to expand my outlook. 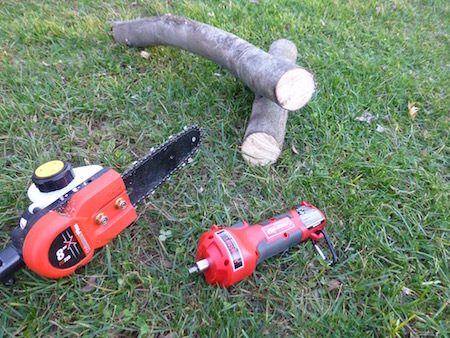 I mean of course I expected to use it to trim overhead branches from trees, but I never considered hedge work, accessing difficult to reach areas, or even using it to prep small logs that I use in my mushroom cultivation projects. The pole saw attachment is versatile as well as flexible. I knew before hand that it had a boom extension that allowed it to extend to 11 feet, that’s great for overhead tree work. But what I didn’t realize was that you could also use it with just one section, making it much shorter and convenient for working at closer quarters or with the material that is on the ground. Once started I got a little caught up with the tree pruning, but I did manage to refrain from cutting down anything that was still alive and standing before I began this trial. It was great being able to reach out and cut those overhead branches without leaving the ground, and the saw did literally cut through the limbs like butter. Eventually I found myself looking for larger and larger diameter branches to remove until I may have veered from mere pruning to doing actual tree work! After that I shortened to boom and began to work on some downed logs that were a few inches in diameter. The TrimmerPlus Pole Saw handled this test with ease also and I felt that I was able to make more precise cuts than I would have with my full-sized chain saw. During the entire process I had zero issues with the chain, its tension, or the oil lubrication system, and was able to focus my time on making cuts rather than fiddling with adjusting or troubleshooting the equipment. So, overall I was very satisfied with the pole saw and the way that it performed. Another thing that I had noticed was that even with the full 11 foot boom attached the pruner was very balanced and easy to use. Despite the fact that I was working overhead and extending my arms a bit it was not at all fatiguing. After this experience with the cultivator and pole saw I know that I will be considering and adding additional TrimmerPlus attachments in the future. Nice article.Well explained.Thanks for sharing. After trimming do you compost the green waste or you get rid of it? Gustavo Woltmann is a big fan of this trimmer! I own a Lawn maintenance company up in Vaughan (Toronto), Canada and today is finally the day Spring has arrived for us! I couldn’t be happier seeing a few snowdrops myself in my yard. Time to pull out the pruners and trimmers! Looks neat and practical, I watched a couple of videos about this. 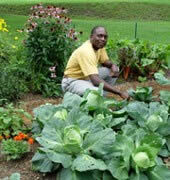 It really makes your garden efforts look much easier. As to the garden waste, while some people prefer to use it for compost, I’d rather use a garden clearance service to take care of it. Great article! Thanks for sharing your ideas with us.